Visitors will find several major collections of plants. Lendonwood is home to one of the largest collections of false cypress (Chamaecyparis) trees in the United States, totaling more than 80 varieties. Similar to red cedar, the evergreen false cypress is native to Japan, Taiwan, Canada and the U.S. Lendonwood has one of the largest collections of rhododendrons in the region, totaling about 250 varieties, adding drama and color in April and May. 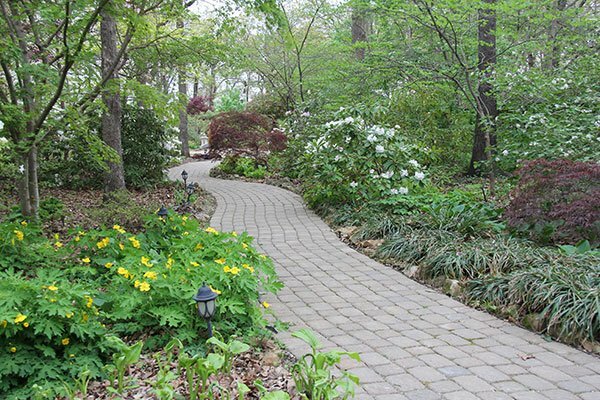 Lendonwood features eight distinct gardens, each with a theme and atmosphere all its own. They include 25 varieties of dogwoods, 75 varieties of Japanese maples, 125 varieties of hostas, 200 varieties of conifers, and 25 varieties of viburnums. With more than 500 varieties of daylilies, Lendonwood has been designated a display garden for the American Hemerocallis (daylily) Society. Inscribed memorial bricks surrounding the Angel of Hope statue may be ordered for $100 each. You may also download the form (PDF) for completion and mail back to Lendonwood with your check. In the American Backyard Garden, plants were selected for their ability to thrive with minimal water, since it is the only area not irrigated in Lendonwood. In summer, the American Backyard displays many colorful annuals, such as zinnias and marigolds. Other plants in the garden include crape myrtle and several varieties of daylilies. 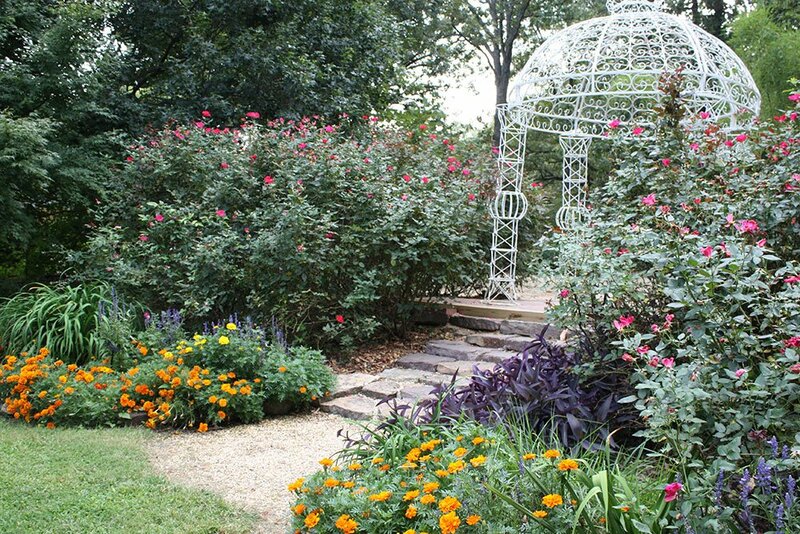 Highlight of the American Backyard Garden is a lovely gazebo surrounded by blooming roses, including a colorful display of Knockout roses. The gazebo is a favorite setting for weddings and special photography. Located just west of the Lendonwood main garden is the newly opened Azalea Garden. Although the flowering shrubs in this garden “room” are mature and lush specimens, the area had not been easily accessible to the public until 2010. Volunteers, including many from Grove Rotary Club, have cleared and rebuilt pathways to meander among these spectacular plants. 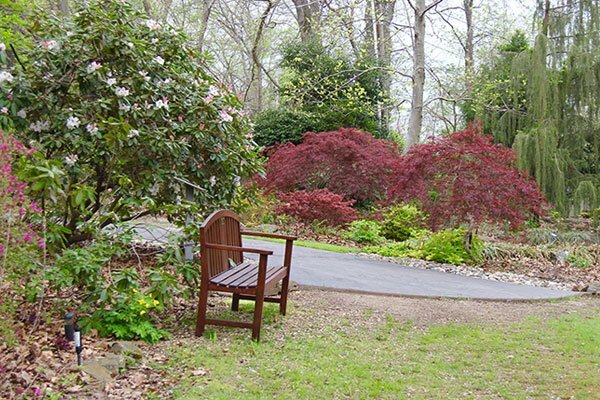 Established in the early 1970s, the one-acre garden also features mature pink dogwoods, Japanese Maples, redbud, yew, magnolias, and a large Canadian hemlock. Many of the azaleas were grown by Lendonwood’s founder, Dr. Leonard Miller, from seed collected from Calloway Gardens in Georgia. 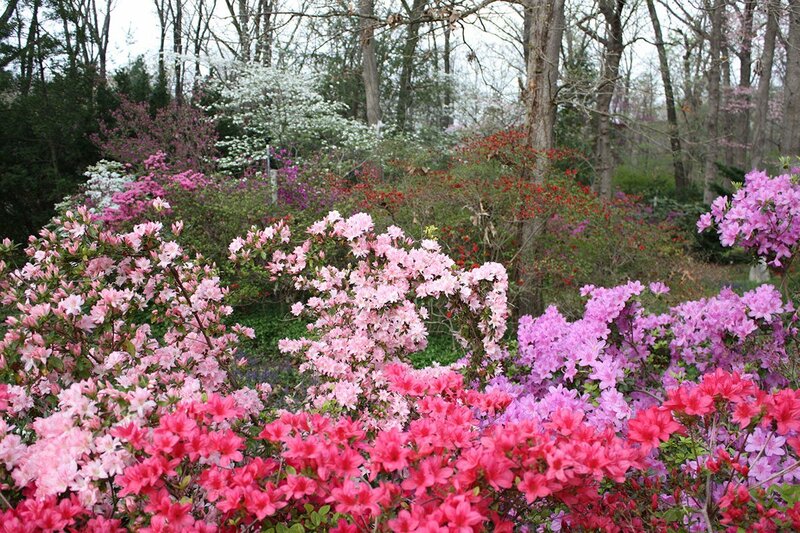 In April, the Azalea Garden is abloom with colors ranging from pink to lavender to red to white. Some are highly fragrant in colors of yellow and orange. Shaded partially by tall oaks, the shrubs enjoy an appropriately acid and loamy soil. 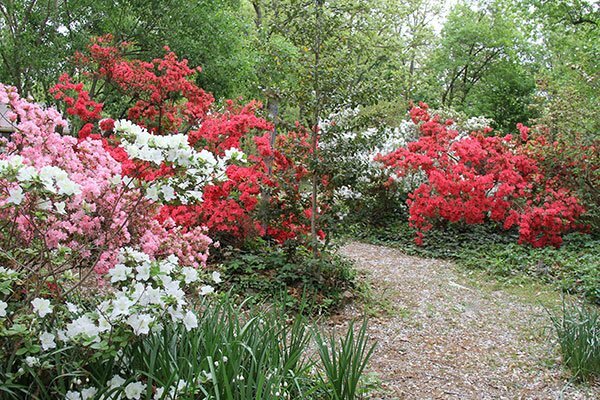 Azaleas, which are within the genus Rhododendron, do well with a mulch of pine bark, pine needles or leaves to help retain moisture and maintain even soil temperatures. Near the Lendonwood entrance is the Display Garden, featuring false cypress (Chamaecyparis) trees and other conifers, such as cedars, spruce, and arborvitae. The Display Garden also includes a large collection of beautiful daylilies, with peak bloom time in June and July. Other collections in this area include many of Lendonwood’s 75 diverse varieties of Japanese maples. 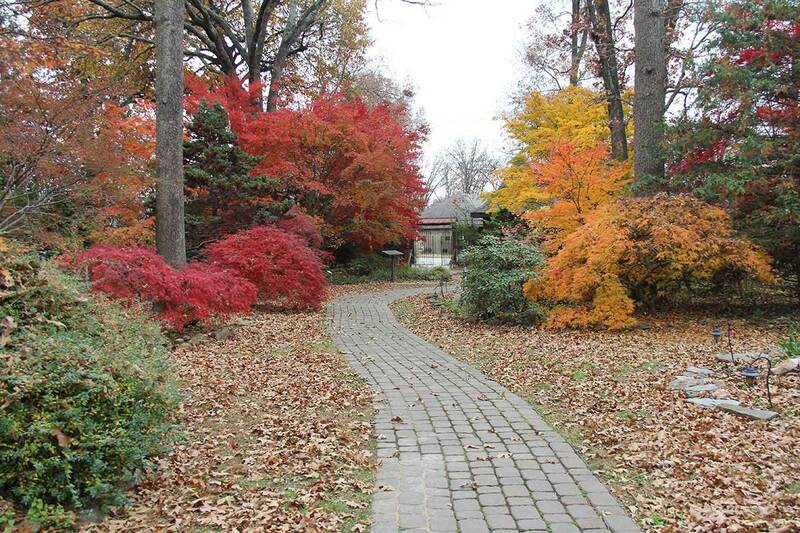 These beautiful trees provide color, form and texture to the garden throughout the year. Also in the Display Garden are a variety of other plants, including hostas, heuchera, and colorful annuals. This garden is home to Nootkatensis, also called Alaskan Yellow Cedar, a stately evergreen. One of the Display Garden’s hidden treasures is the Dawn Redwood, a fast-growing deciduous conifer once thought to be extinct. Near the back of Lendonwood is the English Terrace Garden, planted with numerous rhodododendrons, which bloom in April and May. Most of the world authorities on this spectacular flowering plant are in England. The design of the plantings in this area is more formal and allows more sunlight than other parts of Lendonwood. Also in the English Terrace Garden are the fast-growing Thuja Green Giant evergreens and other trees suitable for screening purposes; a weeping katsura tree; a variegated dogwood; and a beautiful magnolia tree. 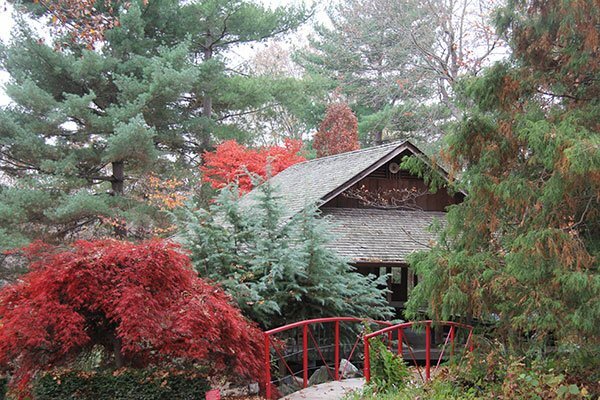 The Japanese Pavilion at Lendonwood Gardens is a popular stop on any tour of the Gardens. With a design based on the Hosokawa Pavilion in Japan, the Pavilion provides a scenic overlook of the Koi Pond and surrounding garden. The Pavilion's floors are made of cypress wood, which is resistant to rain damage. The 3x6-foot sections form a herringbone pattern called "tatami," another word for a straw mat on which to sit or sleep. In Japanese homes, two of these spaces would designate a futon-sized sleeping area for two people, or in the daytime, a space used for two people to sit and talk. The building features post-and-beam construction with red cedar posts set in concrete and fitted into grooves cut into the beams. The structure is strengthened by decorative, yet functional, mortise-and-tenon redwood panels. The furniture was hand-made from rough-hewn western red cedar that was planed and sanded. The Japanese Pavilion is a popular venue for receptions, tea parties, or simply a serene break during a tour of the Gardens. 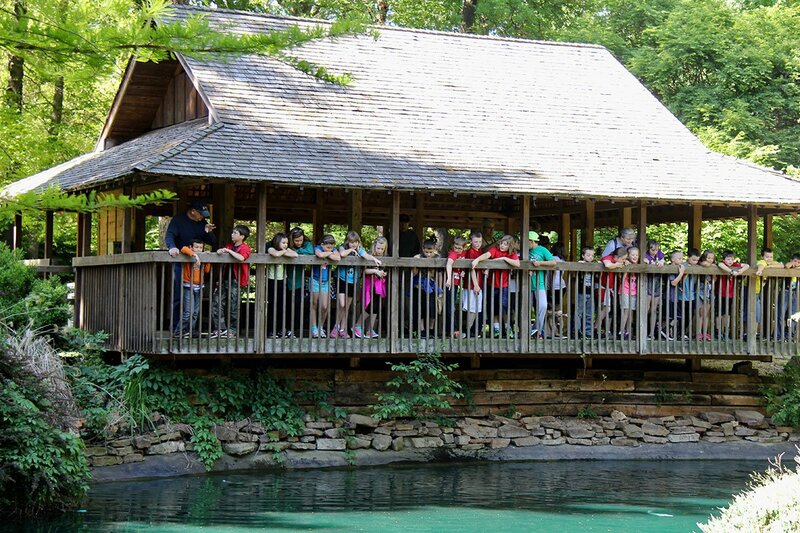 Children especially enjoy feeding the koi fish populating the pond near the Pavilion. A botanical highlight of the area is the large Himalayan Cedar near the Pavilion. 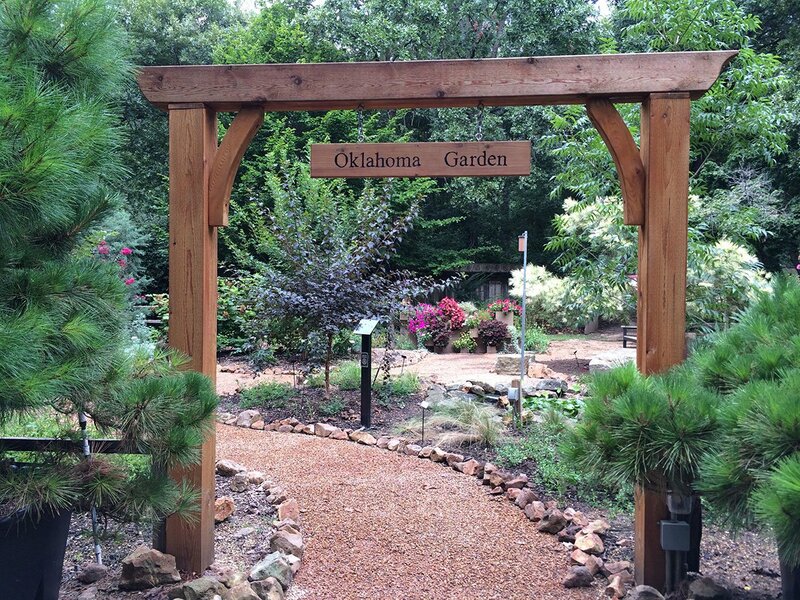 Lendonwood’s Oklahoma Garden, established in 2015, showcases plants and trees most likely to thrive in Oklahoma’s diverse climate. 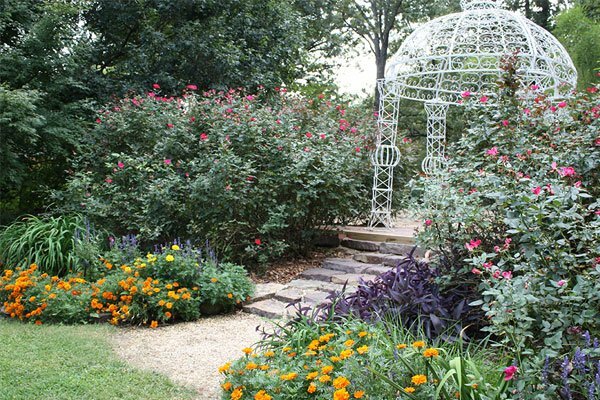 This garden displays various trees, shrubs, perennials and annuals designated as “Oklahoma Proven” by the Oklahoma State University Extension Service. People living in Oklahoma know that the climate can range from freezing wintry weather to hot and humid summers – not to mention high winds or flooding. The challenge to state gardeners is to find plants that can handle such a wide variance. The good news is there are many that not only survive such conditions, but manage to thrive! Thanks to the OSU Extension Service, many such plants have been identified over the years. Lendonwood often is viewed as a place where area gardeners can go for ideas on what to plant. So the Board decided to highlight “Oklahoma Proven” plants, with labels, in a centrally located garden. 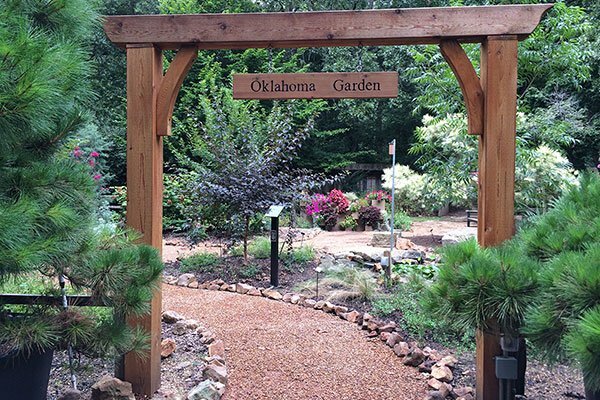 Plants in the Oklahoma Garden range from grasses to vines to trees to perennials. 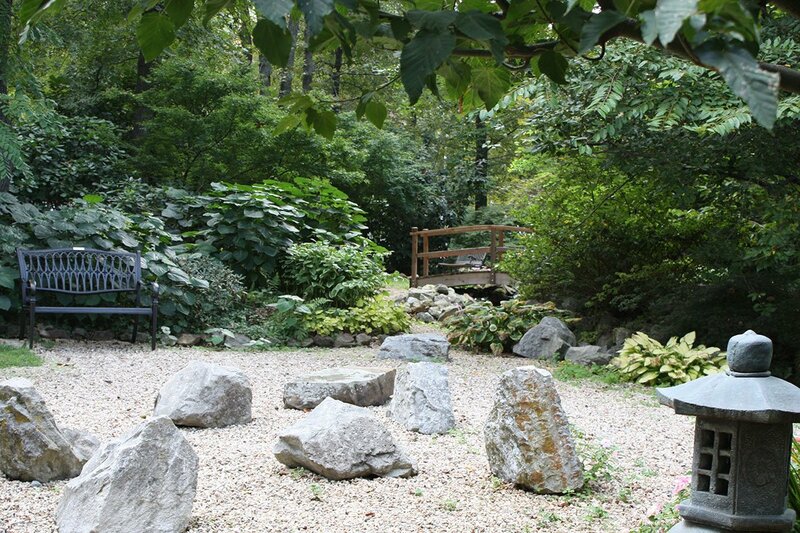 The Oriental Garden focuses attention on plants that thrive in the shade. Most of the 25 varieties of dogwoods are here, as well as azaleas, rhododendrons and viburnums. A diverse range of beautiful hostas can be found here as well, with peak bloomtime in June. Their stunning foliage, however, can be enjoyed throughout the summer. At the end of this garden is a 150-foot stream with several pools of water, each emptying into another. The Oriental Garden also is home to many varieties of lamium, begonias and peonies. 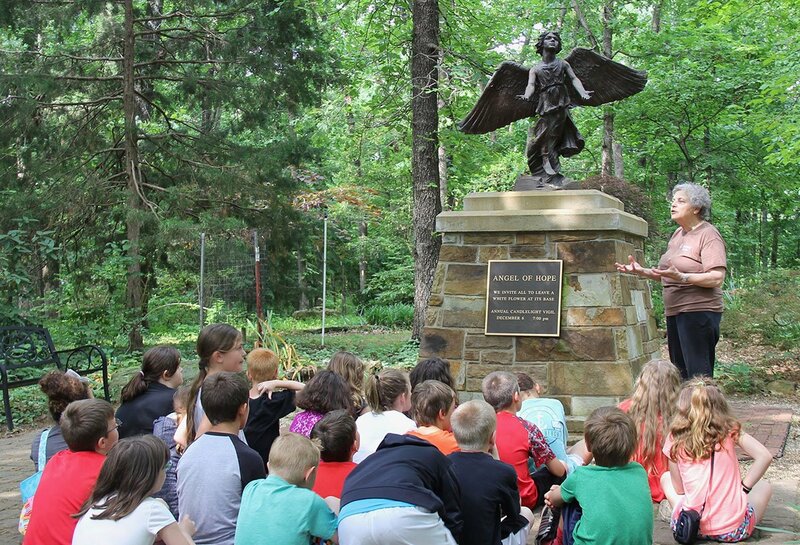 In April 2004, a bronze statue of an angel was dedicated in memory of lost loved ones, especially children. Inspired by the national bestseller novel, "The Christmas Box," by Richard Paul Evans, the statue and serenity garden are intended to bring peace and comfort to those who have lost a child or loved one. The author of the bestseller attended the dedication of the sculpture at Lendonwood. A remembrance ceremony, with candles and flowers, is held each year on December 6, Children’s Day, at the Angel of Hope statue garden. The public is invited to participate in this event in conjunction with other similar ceremonies nationwide. 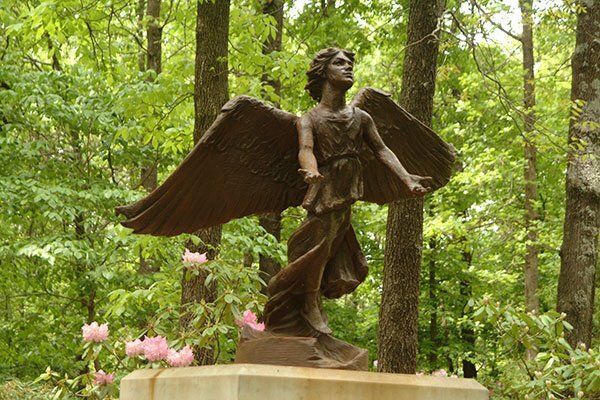 Located on the west side of Lendonwood, the statue's setting offers a serene place where families and friends can spend quiet moments of remembrance. 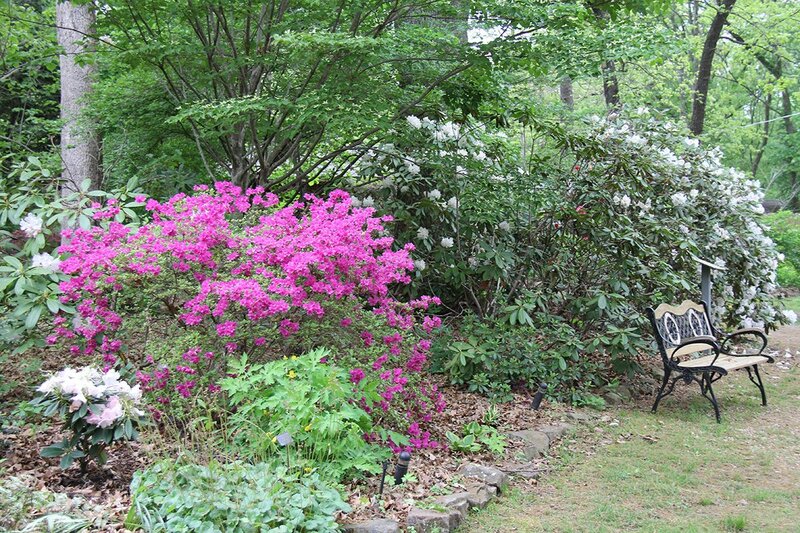 In spring, colorful azaleas and rhododendrons add to the beauty of the garden. For more information on the Brick Memorial Program, contact Lendonwood at 918-786-2938. Bricks surrounding the Angel of Hope sculpture can be donated in the names of friends and family who have passed away. To order an inscribed brick, please complete the Memorial Brick Order Form. The cost of each inscribed memorial brick is $100. Fields denoted by a red asterisk (*) are required.